One of the questions we get asked most frequently is, why would you name your company Kind Home Solutions? It’s a perfectly reasonable question. There are so many great words out there for home improvement companies. Why not something like Efficient Home Solutions or Quality Home Solutions? We also pride ourselves on those attributes so why Kind? The reason is simple; the world could always use a little more kindness. None of us are perfect but we strive each and every day to put a little more kindness out into our community. You see, kindness has a way of causing a domino effect. You do something with kindness in your heart or say something kind to someone else and it causes them to carry on the kindness. If you can brighten someone’s day. Just a little bit. Well, the impact of that kind act could be far greater than you ever imagined. There is a quote that is up on our wall right now to remind each of us to be kind. 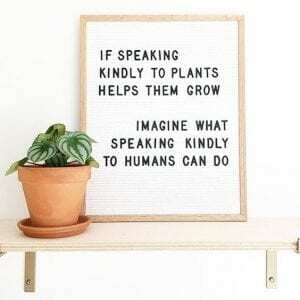 The quote says, “If speaking kindly to plants helps them grow. Imagine what speaking kindly to humans can do”. This quote spoke to us because of the message behind it. We are true believers that you get out of your work and your life, what you put into it. If you spread negativity or treat others with hostility that’s exactly what you’ll get back. However, if you speak through kindness and act with your heart. Well, you’ll get that back in return. Now, we’ve all probably had a situation where we felt we were trying to be nice or kind to someone and we were completely shut down. This could cause you to get frustrated with that person or blame them for the interaction. Before you do that, stop yourself. Being kind is not about anyone else. It is something you do for yourself because it is the right thing to do. It is a choice to be kind and it is a choice we each make everyday. Being kind should not be something you do to receive kudos or praise. It is something you should do because of how it makes you feel. Positive brings positive. Kindness brings kindness. So, how do you practice kindness on a daily basis? Well, first you make the choice to be kind. Next, you do your best to act with empathy. Our lives are so busy and most of us are accustomed to a go-go-go mentality. We struggle when we feel things are slowing us down or inconveniencing us and that can cause frustration and lashing out. Having empathy for others is one of the best ways to spread kindness. Understanding that someone you’re interacting with might be stressed out or preoccupied or dealing with something you’re unaware of. Practice empathy and seek to understand where they are coming from. When we strive to better understand one another, we can connect and still make a positive impact. Obviously we’re in the home improvement industry. Home improvement projects have a nasty little reputation of being stressful for homeowners. We strive to remove that stress through acts of kindness. We listen to our client’s concerns and objectives in order to understand their vision for their home. We put our focus on communication and ensuring our clients are well informed every step of the way. We practice honesty and transparency with our clients. Even when it’s difficult to do so. We believe that being honest and taking responsibility for our mistakes is key to building trust with our clients. There are a million different ways that you can be kind and sometimes it’s even as small as greeting someone with a smile or showing up on time. We challenge you to spread a little kindness today, big or small and see the impact you can make. This entry was posted in Green Living, Tips for First Time Homeowners and tagged ecofriendly, first time homeowner, go green, green living, greener home improvements, small business.